Today's painting is the scene from the drawing I did earlier in the week, with a little composition advice from my friend Suzanne (thanks!). It really makes you want to get out your snow shoes doesn't it? 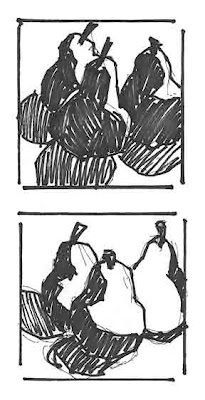 These pears are my demo from yesterday's class. 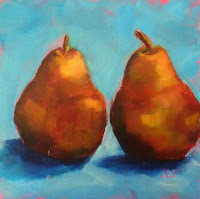 Compare them to the practice "Pears in Blue" that I painted 6 weeks ago. Which pears do you like better? 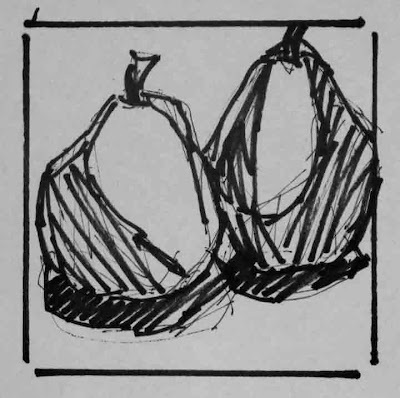 Dianne and Joelle doing several sketches of the pears before settling on their favorite vantage point. 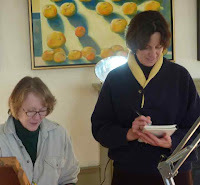 Today was the final day of the two day workshop on daily painting and blogging that I have been teaching at River Arts in Damariscotta. It has been a lot of fun for all of us. 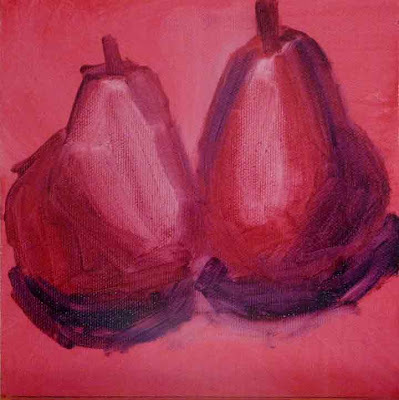 Building on our study of the pears from last week, we painted over the now dry pink value studies. We swapped out the pears for some new ones, so shape and color adjustments had to be made. The idea was to paint each stroke with a different color, and I was impressed with the results. See Joelle's pears above. 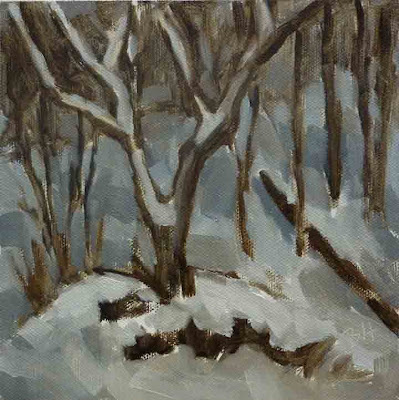 Our final painting exercise was a snow scene, painted from a photo. Joelle and I used a great photo she had taken at Thomas Point Beach as a reference, while Dianne used an evening photo taken in South Freeport. 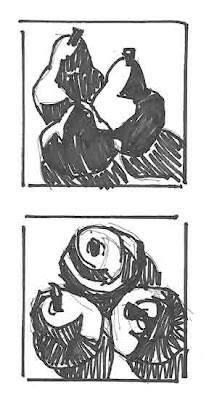 These were done quickly, focusing on the shapes and values, with a limited color scheme, and no initial line drawing. Aren't they great? During the week we had posted our paintings from last week to our group blog, and commented on them. The group blog has been really useful in getting everyone up to speed on the blog elements and posting. I highly recommend it! Inspired by an article in the Pastel Journal, my friend Suzanne and I set off on Sunday afternoon to do some winter plein air painting at Gilsland Farm in Falmouth. The sun was shining and we spent an hour hiking on trails packed down by snow shoe-ers and skiers before we set up to paint. We got some great photos, which turned out better than my painting did. It's really hard to get the values right under those conditions. 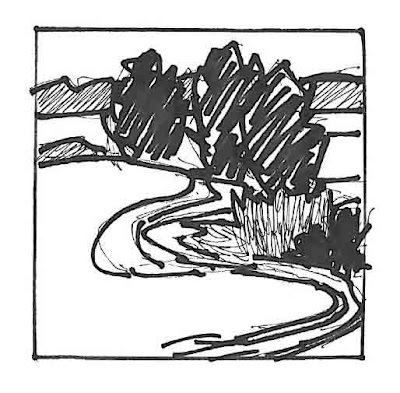 This is a drawing of the north meadow looking west over the Presumpscot River basin. 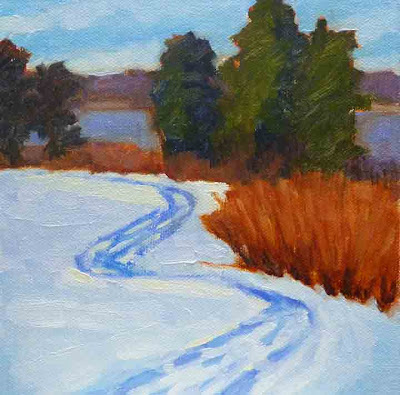 Today was the first day of my two day "daily painting and blogging" workshop at River Arts in Damariscotta, ME. It was lots of fun and we made great progress. After looking at some favorite artist blogs and the blog elements they use, we got down to painting. The first exercise was the 10 minute apple. I did the one on the left above as a demo, and then the class did four each. I managed to get one more in (right above) while they were painting their second and third. We talked about what we wanted to improve between each version. 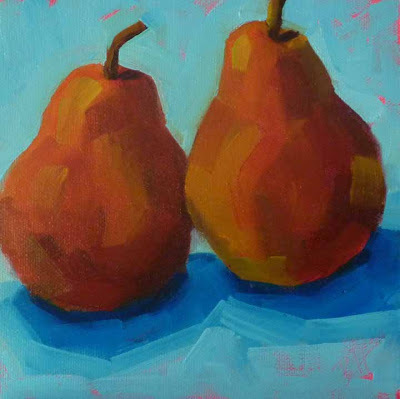 Next the students set up a still life of two pears and then did several sketches of them from different vantage points. I did the sketch above. We followed that with a value sketch of our favorite view. My demo is below. This was a great class, and I look forward to next Saturday when we have our final session. They were a little shy, but maybe I can convince them to let me show you their work next week. 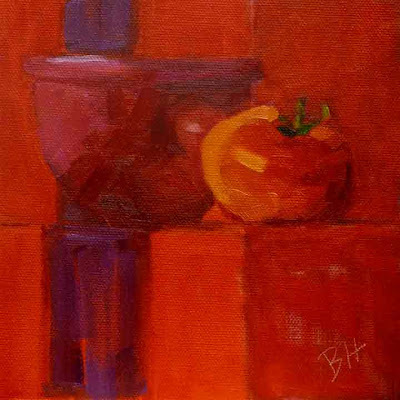 Have you ever set up a still life, done a sketch to get a composition you like, painted the thing, then walked around the other side to leave the room and thought, "wow, it looks even better from this side?" I have! I've also turned around after painting a landscape that really excited me, to see something pretty interesting behind me as well. That's why my friend Marion says on a bike ride, you have to do it in both directions to see everything. So it occurred to me that it would be a useful exercise to do a value sketch from several vantage points. This is my first attempt. Pretty cool, eh? Which one do you like best? It was warmish (above freezing) today, which drew me to this photograph, the stream in the middle would have been running today. Thanks Suzanne, for the photo! Let's go to Gilsland and take some more snow photos, next time it's warmish. I almost forgot to announce my December Painting Giveaway Winner - Stephanie Berry, who I met at the August Colin Page class at River Arts. Stephanie has won "Delicious 2". Stephanie was my guinea pig for part of the daily painting and blogging class that I will be teaching at River Arts on the 23rd and the 30th of January. Thanks, Stephanie! Do check out her painting blog. It looks great. 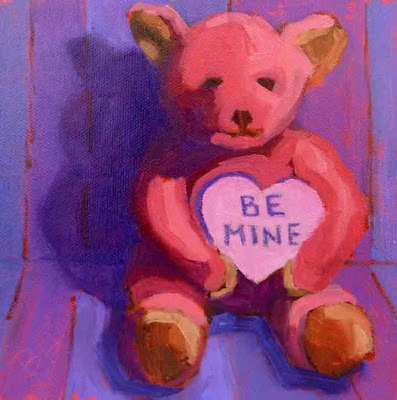 Here's another painting for Valentine's Day. This one has a story. The bear is a cute terry cloth guy, and belongs to our airedale, Mac. It isn't really a dog toy, so he doesn't get to play with it often, and then for just a few minutes, because it can't take the rough and tumble (and chewing) of the real thing. He truly loves it, makes it squeak, and looks longingly at it when it is on top of the fridge, in its usual spot. But it's pink, right? And so cute, I couldn't resist. Mac doesn't mind. And he can't read the sign. I know it's early for this, but I'm doing a few paintings to see what I can come up with for the Valentine's Day show we are having at the Yarmouth Frameshop and Gallery. 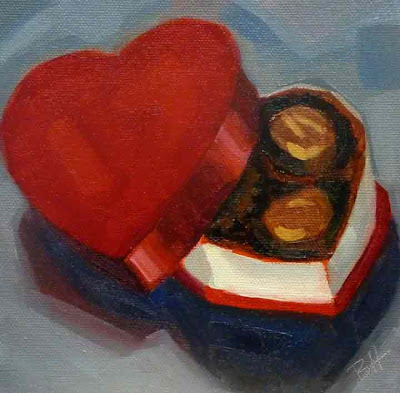 I have several ideas, and couldn't resist the traditional Valentine's Day candy box. Amazing how hard it is to make that lid look tilted! My husband thinks one of the chocolates should have a bite out of it, but I wasn't sure about that. 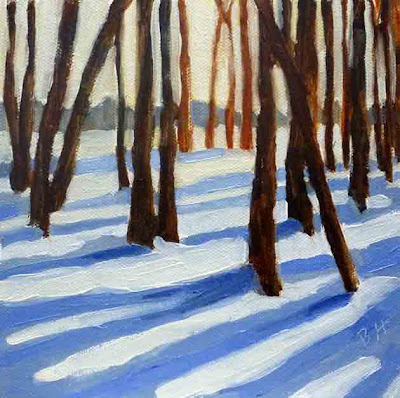 I'm into winter scenes now, and looking forward to painting one outside. This one was done in the studio, inspired by a photo. The nice burnt sienna underpainting came from a wiping off previous versions of the drawing. I had some fun getting a composition that was just right, and the rest always goes more easily when that happens. One more reminder of the Blogging and Daily Painting workshop I am teaching at River Arts in Damariscotta, ME, January 23 and 30th. In this two day workshop we will go over questions such as: how can I tell if people are reading my blog, and how they found it, how can I encourage comments? See the River Arts workshop list for details. 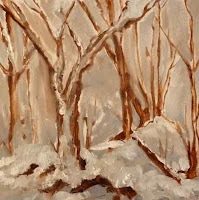 "Dusk in the Winter Woods"
Sometimes they just fall off the brush, though usually not when I am on a tight schedule! This was painted looking out my friend Suzanne's window and the light was fading fast. There was no choice but to capture the feeling as quickly as possible. I never even went back to my photo reference. I love how it came out. 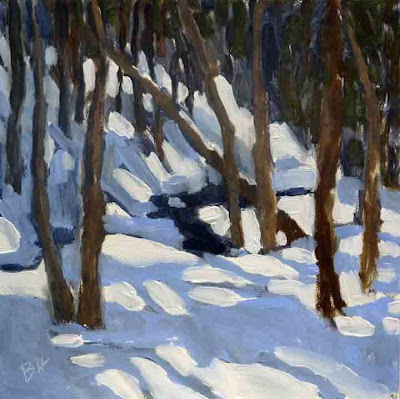 Just another reminder of the Blogging and Daily Painting workshop I am teaching at River Arts in Damariscotta, ME, January 23 and 30th. In this two day workshop we will go over questions such as: how do I set up a blog and process photos of my work to present, how often do I need to post, and how do I attract viewers to my blog? See the River Arts workshop list for details. I just love the red table linens that I got before Christmas. Add a red bowl and a tomato, and there is red everywhere. Very cheerful when the snow is falling! 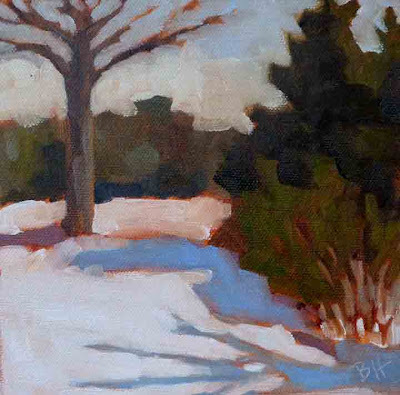 Upcoming Workshop: Blogging and Daily Painting at River Arts in Damariscotta, ME, January 23 and 30th. In this two day workshop we will go over questions such as: Blog, website, Facebook, Twitter - which of these do I need to promote my artwork? See the River Arts workshop list for details.